Ok so it has been a while. I have done some testing on LDP based mVPN at this stage, not a huge amount, mainly basic functionality. The first thing to note is 7750 MUST run in chassis mode D to allow the multicast commands required for mLDP. This means no IOM1 or IOM2 cards are allowed in the chassis and because of this I have a limited topology to play with. Both PE routers are SR12s running CPM2-400G and have IMMs or IOM3 in the CE facing slots. The CE routers are Cisco 1841, r4-ce1-rp is the RP and also the receiver, it’s config is below. r5-ce2-src simply runs PIM on its uplink to pe2 and will source traffic to group 224.1.1.1. Roll on up the 7750s. The first task we do is create the VPRN service and place the CE facing interface in to the VRFs PIM process. I have configured the CE facing interface name as “mvpn” just for clarity, it has no bearing on the mVPN configuration. 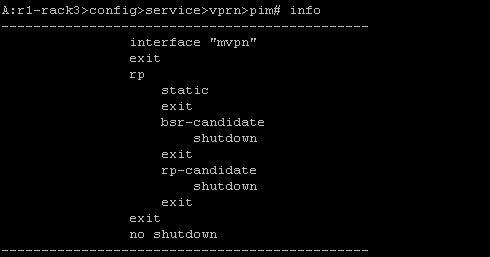 The remainder of the config is exactly the same as standard VPRN. PIM configuration is very straightforward, all I do is enter the PIM process and add the interface. The rest of the config below is defaulted. I won’t be setting the RP address as I think that’s intrusive on the customers experience, they should have the freedom to change their RP as they see fit. So that is the very basic element complete. Now we just need to do the entire core! Well not so much. 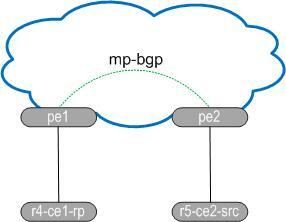 Per the diagram above I already have MP-BGP configured and both routers have address family mvpn-ipv4 activated. I also have VPNv4 activated, not much point having mVPN and no IPv4 VPN to use. Would anyone buy that service? I have links to routers that do not run in mode D so multicast processing should be disabled. OK so with MP-BGP and LDP multicast enabled we can configure the VPRN to carry the customers traffic. That will come in the next post which will see the VPRN config and debug behaviour when the services comes up and how BGP updates trigger switchover to the S-PMSI. Nice article…But topology is too simple. Can we add more P routers in it ? I can’t add any more routers at the moment because everything else I have has IOM1 in them so I won’t have the ability to configure multicast-traffic enable on the network interface. I am trying to source some more so should be able to add two more 7750s to the topology soon. At that stage I can put in more info but I think the real benefit there would be in terms of show/debug commands. Config is config regardless of how many P/PE you have. I will have another post with debug and stuff soon so hopefully I will have 2 Ps at that stage. Nice article. I always follow your blogs as there is not much information and blogs for 7750…Can we extend this scenario to have more complex topology ? Great effort. You’re my man. Keep it up!